Analysis The storage heartland is under attack from six armies, and each one aims to wipe out some or all of the core networked file and block arrays that form the bulk of the installed storage array base. 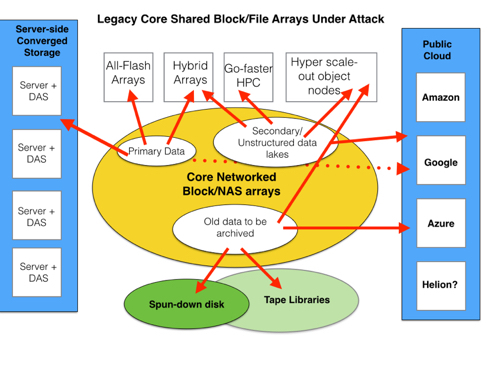 These invading forces are exploiting weaknesses in block and file arrays centred on data access latency; expense; limitations in capacity and performance scaling; the increasing unsuitability of RAID protection as disk capacity and array disk numbers rise; and the inability of a general-purpose array to be optimised for specific use cases. All-flash arrays for lower latency — such as Pure, SolidFire, XtremIO, FlashSystem, FlashRay, etc. Hybrid arrays for lower latency and better value money for newer use cases, such as VDI (Nimble Data, Tegile, Tintri). Go-faster HPC-style arrays — such as DDN, Panasas, Seagate/Xyratex, SGI, etc. Hyper scale-out stores for vastly-increased scale and RAID protection scheme avoidance — Amplidata, Caringo, Cleversafe, Scality, Atmos, etc. Server-side storage in converged/hyper-converged systems for lower latency and simplified purchase and management — such as Nutanix, Maxta, ScaleIO, Simplivity, VSAN. The public cloud for significantly lower cost and better scalability — such as Amazon, Azure, Google, and a few more. The all-flash arrays, hybrid arrays, HPC-style arrays and hyper scale-out systems can all be classed as the shared/networked array re-invented; the same dog-and-pony show but with a stronger dog and bigger horses, maybe even herds of horses. The other two invaders want to replace the core arrays with something completely different. Converged and hyper-converged server/storage/network systems want to provide a virtual shared resource from each component nodes' direct-attached storage (DAS), aggregating it together to provide a virtual SAN with, sometimes, a NAS head for file access. The cloudy companies want to store all data in their remote data centres (the cloud) and have computing done there too, constituting a clear and present danger to all enterprise data centre server and storage suppliers, which includes the converged/hyper-converged system startups as well. And most emphatically, hybrid cloud systems featuring cloud-style storage service for users and links to/integration with the terrible trio of public cloud suppliers — Amazon, Azure and Google. Let's take a 10-year view and ask where this is going? There won't be one replacement for legacy storage arrays. Instead each of the six invading technologies will get their piece of the pie, but not all of it. A substantial chunk will be left for the legacy array suppliers, but not a big enough piece to support all the products pitched at it by the suppliers listed above. HP and NetApp are in good shape as they each essentially have one unified file/block product line; 3PAR StoreServ and ONTAP FAS respectively. Dell is moving that way by combining the EqualLogic and Compellent lines into a single product set. IBM has a problem; too many overlapping products. Storwize will probably emerge as the main product with the DS8000 safeguarded by mainframe customers. XIV and DS-whatever-else disk arrays will probably fall away over time. EMC has a problem with VMAX, VNX and Isilon all being classic file/block arrays. It's conceivable that VMAX and VNX will merge and become scale-out in nature, eroding the role of Isilon, unless EMC sends it towards the hyper-scale-out/object area area. HDS will likewise have to merge VSP and HUS. Fujitsu will have a tough time with its ETERNUS arrays buy may, we stress may, eventually walk away from the classic file/block array space, concentrating on the newer areas, such as hyper-scale storage with its latest Ceph-using CD 10000 array.